Last week started with a spot of vodka tasting. Not because we’re drastically irresponsible, but because our unwavering dedication to getting involved with the full brand experience meant that we had to have a sip of luxury Angels Tears Vodka, before starting work on their new website. Of course. 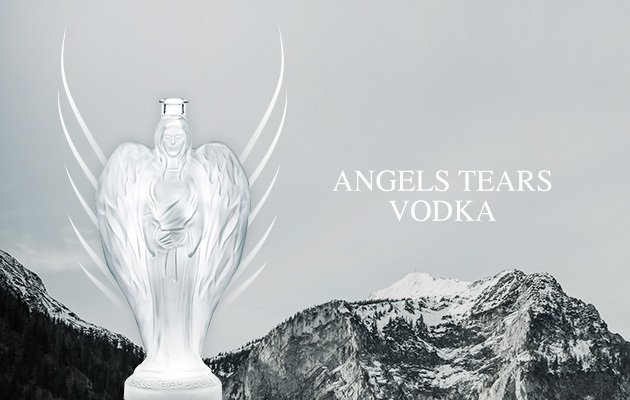 As a premium vodka, Angels Tears has achieved the combination of a smooth, clear taste and a memorable brand. A pure grain spirit hailing from the icy glaciers in central Georgia, the liquid has been triple distilled and filtered through charcoal to ensure its absolute purity. It’s then bottled in a large glass angel. Yes, you did read that correctly. The angel was inspired by pre-Renaissance artistry and religious statues, then designed right here in the North East, and finally made in Italy. This bottle is a unique and bespoke design, created in frosted glass. It seems it’s already becoming quite the collector’s item, something to keep even after you’ve drained the last drop. And yes, it is as heavy as you’d think. Angels Tears, and Anthony Oswald, the man behind the angel, came to us needing a site that reflected the essence of the brand. It was to be a single scrolling page to tell the story of his vodka and include links to be able to purchase the product. We worked with Anthony’s vision and delivered a site that fulfils the brief. The site went live last week and will be followed by a full page advertisement in the January 2016 edition of both Vogue and GQ. This is an exciting venture for Anthony and we will be looking at how the site can grow in the not-too-distant future by adding the capability to sell Angels Tears directly through the site. We look forward to seeing the distinctive angel-shaped bottle behind the bars and on the tables of the UK’s finest establishments. You can have a look yourself on the new Angels Tears Vodka site here. If you are looking to create an online presence for your brand, either with a new website or a redesign your existing website, please don’t hesitate to get in touch.